Wash and chop lettuce. 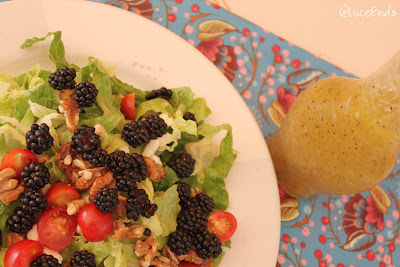 Sprinkle with cheese, candied walnuts, blackberries, and cucumbers. Pour dressing and enjoy! I learned how to make these from Heather over at Days in Africa. Thanks Heather! Melt the sugar on medium-high heat in a pan on the stove. Stir a little as it starts to melt so that it won't burn. Once liquid, remove from heat and dump in walnuts, stirring to coat. Let them sit for a few minutes to cool, then break apart and serve!